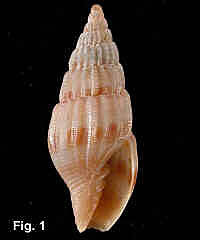 Description: Shell turreted, with a prominent bulbous protoconch. Axial sculpture of strong evenly spaced folds on all whorls, 15-29 on the penultimate whorl. Axial folds crossed by dense, fine spiral lirae. Base of body whorl with strong spiral grooves. Columella with four strong plaits, stronger posteriorly. Outer lip simple. 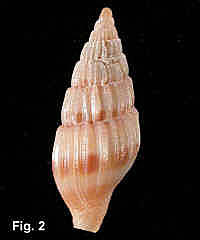 Colour fawn, body whorl with three spiral brown bands; one below suture faint, one at midbody strong but interrupted, one at base weaker; the upper two bands present on spire whorls. Size: Up to 18 mm in length. Distribution: Endemic to Australia; Sydney, NSW to Westernport, Victoria, and eastern Tasmania. Habitat: Taken in 11-183 metres. Uncommon.